Our previous work has demonstrated a strong role for maternal micronutrient nutrition in fetal growth and risk factors for type 2 diabetes in their offspring. Mothers with low intakes of micronutrient rich foods had babies with lower birth weights, and higher insulin resistance in childhood. Our studies suggest that an imbalance between folate and vitamin B12 , both part of the 1-C metabolism cycle, may be particularly important. We have commenced interventional trials of micronutrient supplementation before and during pregnancy. 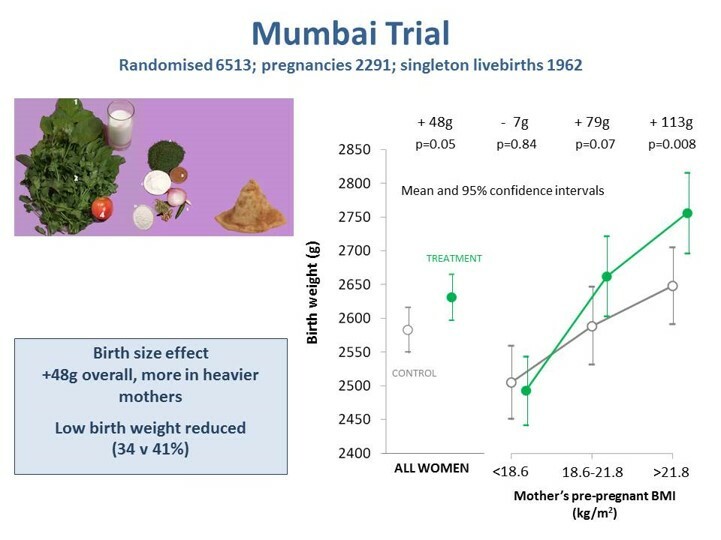 The Mumbai Maternal Nutrition Project (MMNP) was a community-based randomised controlled trial among women who lived in the slums of Andheri, Bandra and Khar in Mumbai. The main aim was to test whether improving the micronutrient quality of their diet using local foods before conception, and throughout pregnancy, increases birth weight and improves the children’s long-term health. 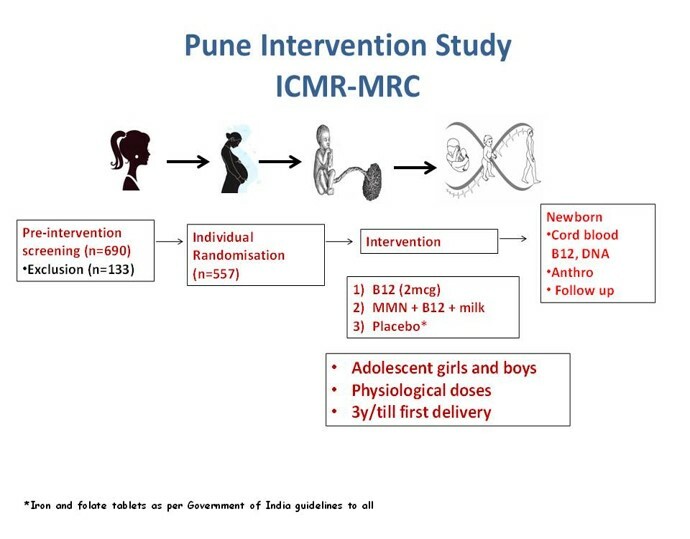 The Pune Maternal Nutrition Study (PMNS) was established in 1993 to prospectively study the influence of maternal nutrition on fetal growth, and later cardio-metabolic risk of the offspring. B12 deficiency was widespread in this population and is due to low intake. We have commenced a community-based B12 intervention study with three groups in the adolescents (n=557) from this cohort , to receive daily for at least 3 years or until their first delivery: 1) vitamin B12 2µg; or 2) B12 2µg plus multiple micronutrients plus 5g of milk protein or 3) placebo. The main hypothesis is that vitamin B12 supplementation of adolescent girls improves their offspring birth weight and B12 status, newborn and childhood body composition (reduced adiposity and increased lean mass), and reduce future diabesity. The results of these trials, and the findings from the follow-up of the children will have significant implications for public health policy in India.